I did some baking over the weekend. I had some rhubarb in the freezer that I had previously blanched to keep its colour and some granny smith apples that needed using. Pie time! I will admit that I did use the quick option of using pre-made pastry. I can make pastry and have done many times. Sometimes you need a quick option for a yummy treat. My husbitect also did some cooking and made a delish chilli jam. I shall take a photo of the jam being enjoyed and add a recipe soon. For the pie filling, I cored and thinly sliced four granny smith apples and heated them with the rhubarb (about two cups; chopped + blanched), a tablespoon of butter, a little caster sugar, a squeeze of lemon juice and cinnamon. Once the apple and rhubarb were softened, I added about half a small packet of blanched almonds for a little crunchiness. I greased the pie plate with butter, lined it with pastry, added the filling and topped with more pastry. The top layer split a little so I pressed it back together and used some little hearts cut from leftover pastry to stick it together. Then added even more hearts. I like to glaze pie pastry with milk for a crisp, brown finish. It took about 45mins to bake at 180C. Served with vanilla ice cream. Nom! Do you decorate your pies with leftover pastry? That looks DELICIOUS! 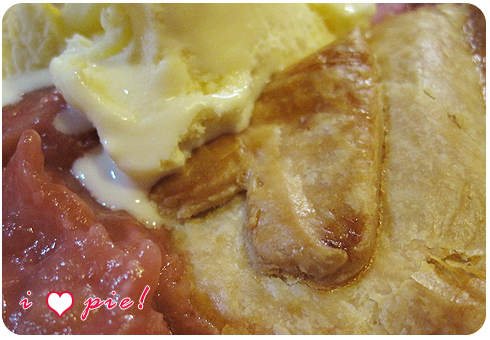 I LOVE rhubarb and apple pie! 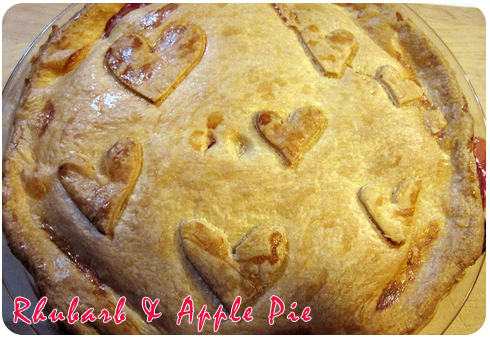 And, yes, I decorate pies with leftover pastry too! I did some baking myself on Saturday – I decided I needed a baked rice pudding. Check out the results on my blog! oh yummy! I can taste it from here. lol. I have been baking alot the last few days. Sunday made a brownie slice, a lemon fruit slice and 52 cupcakes (for soccer clinic). Yesterday it was 52 chocolate crackles. lol. There will be more making of stuff later this week. Probably orange cake and more cupcakes. Kylie – Shall visit your blog – I love rice pudding, should try that myself!